FitBody Fifty: Miracle cure or scam? ...or just a good food choice? Miracle cure or scam? ...or just a good food choice? 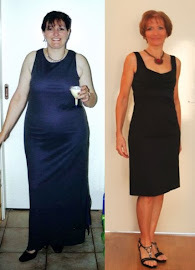 A couple of years back, it seemed that Himalayan Goji Juice was being touted everywhere as a miracle weight loss product and a cure for just about any health problem you could possibly think of. Being the big old skeptic that I am, I decided to do some research and find out the facts. Ha! I could not find a single independent, objective opinion on this stuff. I could barely find anything at all that wasn’t a blatant advertisement for the product. So I filed it in the back of my brain as some new age fad, probably a scam, and more or less forgot about it. The product’s credibility wasn’t helped by the marketing methods used, which were basically a pyramid selling system. (Anyone who gets involved in one of these deals has to be incredibly naïve – it should be obvious that the only people who make money from these schemes are those at the top of the pyramid. I read an article recently about Amway, which stated that 97% of sellers don’t make enough money from their sales to cover their business setup costs. Hardly surprising.) I learned all about pyramid selling when I was about 12, and I refuse to buy anything that’s sold via those methods, or get sucked into selling products that way. And just quietly, bombarding me with spam emails promoting the ‘amazing benefits’ of a product is not going to make it seem any less dodgy, OR make me buy it. Does anyone actually BUY stuff advertised via spam? Anyway…. Goji juice and dried berries are now becoming available in supermarkets and health food stores. I saw the dried berries at Safeway the other day, which got me thinking about this ‘miracle’ product once again. So I did a little internet research, and discovered that not much has changed: Almost the only ‘facts’ available are on websites run by those selling the products, and the evidence presented is all anecdotal – nothing backed up by hard scientific research. I found only one reference to a proper study, using a control group who received a placebo. The object was apparently to determine whether goji juice aids weight loss, and the results of that study were that there were no significant differences between the two groups. After a fair bit of searching, I finally found a Wikipedia entry and a few other snippets that allowed me to piece together some facts. This is not a new fruit to the Western world. It’s been around for centuries, growing in south-eastern Europe, and being known by various names. It was introduced to the UK around 1730 and grows wild in parts of the country today. The most common English name is Wolfberry, and the fruit has long had a reputation for its health benefits, just like many other plant species throughout history. 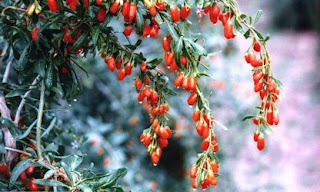 There are a lot of claims about the almost magical properties of the ‘Himalayan’ goji fruit, but it seems that no such variety actually exists, as the plant can’t survive the inhospitable climate there. The fruit is popular in China though, and even has a festival devoted to its harvest. It’s long been a common ingredient in traditional Chinese medicine too. I’m not going into all the supposed benefits of the plant – like many berries, the fruit is packed full of nutrients, but it has a bit of a unique nutritional profile in that it contains a number of amino acids, as well as the usual vitamins and minerals. Assuming that this is all true, there seems little doubt that it would be a good food to include in your diet, along with the 20 or so well-known “superfoods”. These vary a bit, depending on which expert you ask, but this is John Berardi’s list, which is very similar to most of those I’ve seen. So, juice or fruit? Apart from the fact that I’m not a juice fan (I like my food in solid and stomach-satisfying form, thanks), the goji juice sold here is unlikely to be pure and is usually mixed with other fruit juices. Labelling does not usually state what percentage is goji juice, so you’re taking pot luck. There would have to be some loss of nutrients in the juicing and packaging process too. The sketchy info that’s available indicates that the whole fruit is far more beneficial than any juice or juice mixture anyway. Unless you live in a region where the plant is grown though, you’re only going to get the dried form. There’s one caution with this: if the dried fruit is bright orange or red, it may have been treated with sulphites (a common practice with dried fruit), which can cause problems - particularly with asthma - for people who are sensitive to these chemicals. Other than the sulphite thing, I can’t find any negative side to the stuff. Except for the unscrupulous sellers out there, who have: a) ripped thousands of gullible people off ($25 for a bottle of fruit juice – pfft! ); and b) blatantly lied to people, with unsubstantiated claims that it can cure cancer or whatever… None of that is the fault of the product itself, of course, just the result of some nasty scammers who’ll grab any opportunity to take advantage of people and make a quick buck. So, the verdict? I think I might pick up a pack of the fruit and give them a try. I’m not quite sure what to do with them, but I suppose using them in muesli or protein bars would work. Has anyone else tried the berries, and if so, what do you do with them? The Wiki entry is here, if anyone's interested. I am with you on the pyramid selling. But they do say a sucker is born every minute and there is always someone who things that they will be the one to beat the odds. I hope your building issues get fixed. At least it sounds as if you are well aware of the problems and the builders are addressing them. We had issues with this house (built in '99) and they weren't properly fixed. Nothing major but damned irritating and I have been constantly reminded of them. Hey, I wanted to try the berries too so got the dried ones. I put a teaspoon in my oats and cook it up. They're a funny taste by themselves. Not sold on them, but I'll finish the packet. I eat the dried fruit in my oats. I soak my oats and the gojis overnight and then cook my porridge with protein powder in the morning. When its done I stir in 2t LSA, 2t psyllium husks (gotta love that fibre) and 1T lite soy milk. Delish and VERY filling. BTW there are some GREAT internet deals for some AMAZING products. We are constantly being offered V**gra AND p*n*s enlargements. How lucky are we??!! Took me weeks to get rid of amway, when I accidently agreed to a meeting. Two minutes in I figured who they were, even though they didn't tell me until the end of their presentation, and all the while trying to figure a polite way (the brit in me) to get rid of them. Only being rude worked. A friend of mine gave some gogiberries to me (also sold in asian grocers as wolf berries for half the price) and suggested I put them in a spag bolognes. I was making chilli con carne instead that night and used them in that YUM! The flavour of the gogi goes perfect with sweet acidity of tomatoes in my mind. I'm now thinking I might cook them in my brown rice.